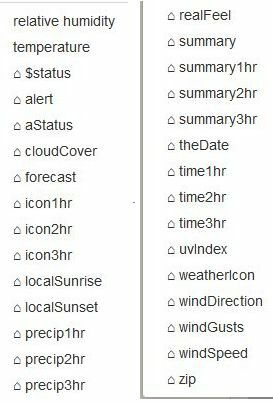 Evidently weather underground is pulling their free api. Does this mean smartthings will stop giving that info too? Currently you don’t need an api key to get info from smartthings, however are they going to drop this too? Geesh… I didn’t realize IBM now owns “weather. com” and “wunderground. com”. I am keeping my PWS up until I write something to replace it. I am running WeeWX on a Pi, so I’ll just have it create json files to pull into my pistons with the data elements I need. Any updates on this? Are we going to lose all weather API functionality? With the shutdown less than a month away, is there an alternate weather data option? I use the AccuWeather plugin for SmartThings. It is actually seen as a device, so you can make triggers from the weather events. For instance, you can code: If AccuWeather’s temp rises above 74 degrees, do X. That is one feature that was not available with WUnderground without requesting the current data first. Now that I look at it, I suspect only temperature and humidity can be used as a trigger directly. Slightly off topic, but can anyone recommend a dirt cheap weather station that can upload to WeatherUnderground? It looks like that may be a way to get around the $850 a month to use their API.